06/29/17 Links of the Day: Rover Asks FERC to Approve Drilling; New Ohio Injection Wells Approved; And More! Gas & Oil: Record Keeping Essential to Prove Lack Of Production in Paying Quantities - "Oil and gas leases typically include language indicating that the lease will remain in effect so long as the leased property continues to produce oil and gas in paying quantities. Ohio courts have long held that a well is producing in paying quantities if the revenues from the well exceed the expenses involved in maintaining the well. Unless production from the leased property has ceased..."
Ashland Times-Gazette: Rover Pipeline Fine Will Be Used for Work at Ashland County Courthouse - "Ashland County should be receiving its $50,000 payment this week as part of a settlement with one of the companies building a natural gas pipeline across Ohio. During a departmental update Thursday, building maintenance supervisor Dennis Harris told Ashland County commissioners the check was mailed Monday from Houston-based Energy Transfer Partners. The company is building the $4.2 billion Rover pipeline to carry natural gas from wells in the shale areas of southeastern Ohio to distribution points in..."
Bloomberg: Shale's Record Fracklog Could Force Crude Prices Even Lower - "There’s yet another concern growing as oil prices continue to erode: A record U.S. fracklog. 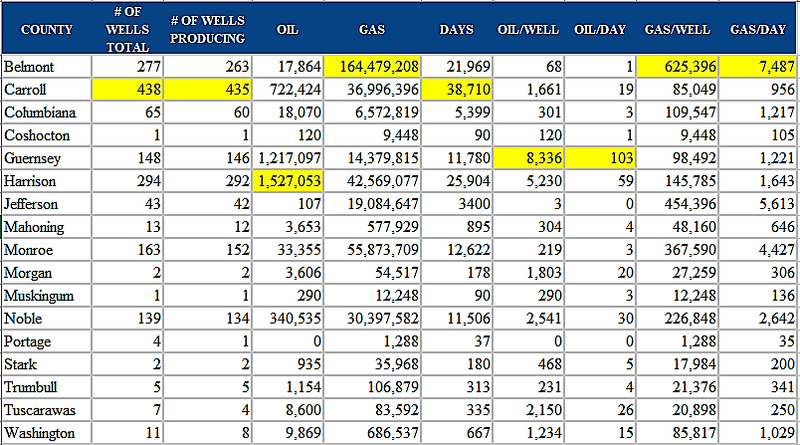 There were 5,946 drilled-but-uncompleted wells in the nation’s oilfields at the end of May, the most in at least three years, according to estimates by the U.S. Energy Information Administration. In the last month alone, explorers drilled 125 more wells in the Permian Basin than they would..."
The Courier: Marathon Completes 50-Mile Pipeline in Northwestern Ohio - "A new 50-mile pipeline, constructed between Harpster in Wyandot County and Lima in Allen County, is operational and will supply fuel to 10 Midwestern refineries. The new line is a project of Marathon Pipe Line, a subsidiary of MPLX. On Tuesday, company officials said it took 450 contractors over one million man-hours to construct the pipeline, but the project was on time and under budget. 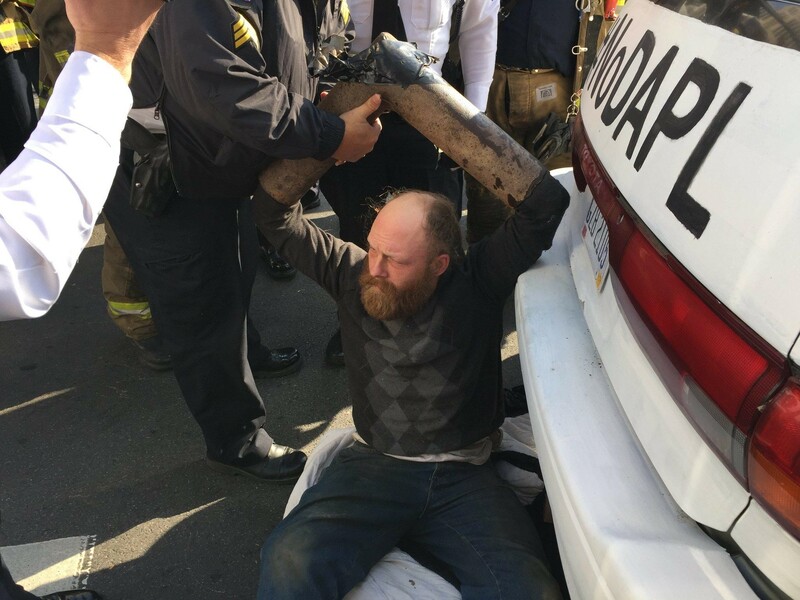 The pipeline, known as Harpster-Lima, passed several tests during..."
Gas & Oil: Supreme Court to Rule on Free Gas vs. Lease Argument - "The Ohio Supreme Court must decide whether the acceptance of free gas is sufficient to prevent a property owner from terminating an oil and gas lease on her property. Justices heard oral arguments on that issue Tuesday in a case pitting a Washington County landowner against an oil and gas company, with the decision having implications for other leases across eastern Ohio’s emerging shale gas and oilfields. “The appeal concerns a fundamental question that directly and immediately affects..."
The Repository: Working to Keep Pipelines Secure - "Regional first responders gathered Tuesday at the Stark County Emergency Management Agency to discuss how to safeguard pipelines and respond to emergencies with them. The meeting was timely given the ongoing construction of Energy Transfer’s Rover Pipeline in Stark, Carroll and Tuscarawas counties. Class attendees included..."
Tribune Chronicle: Public Hearing Set for Proposed Energy Center - "So far, most of the comments Mayor Arno Hill said he’s heard about the proposed Trumbull Energy Center have been positive. But he will be better able to gauge community views on Clean Energy Future’s plans to build its second electric generating facility along Henn Parkway following a public hearing next month, Hill said. “I’d say 90 percent of what’s being said..."
Business Journal Daily: ODNR OKs 2 New Injection Wells in Brookfield - "The Ohio Department of Natural Resources has approved permits for Pittsburgh-based Highland Field Services LLC to begin work on two new wastewater injection wells in the township. Highland Field Services submitted its permit applications on Jan. 19, seeking approval for two injection wells — No. 1 and No. 5 — on land just west of state Route 7, north of Warren-Sharon Road, or “Old 82,” and south of Merwin Chase Road, according to documents filed with..."
WFMJ: Suit Alleges Pollution Violations by Warren and Drilling Waste Treatment Plant - "An environmental watchdog group has filed a lawsuit in federal court claiming that the City of Warren and an oil and gas waste disposal facility in the city are responsible for violating standards for chemicals being allowed to flow into the Mahoning River. The Michigan-based, Fresh Water Accountability Project filed a civil action in..."
Marcellus Drilling News: Rover (Again) Asks FERC For Permission to Finish Horizontal Drilling - "Yesterday Energy Transfer Partners, the builder of the Rover Pipeline, once again asked the Federal Energy Regulatory Commission (FERC) if they could pretty-please-with-a-cherry-on-top resume horizontal directional drilling (HDD) in a couple of key locations in Ohio, so they can finish phase one of..."
WASHINGTON, D.C., June 27, 2017 – API today released a new study on the benefits natural gas brings to the nation in terms of consumer savings, family-sustaining jobs and economic growth. The study shows that all 50 states benefit from natural gas produced domestically, including non-producing states. API represents all segments of America’s oil and natural gas industry. Its more than 625 members produce, process, and distribute most of the nation’s energy. The industry support 9.8 million U.S. jobs and is backed by a growing grassroots movement of more than 40 million Americans. After teaching geophysics at Stanford for 30 years Mark Zoback took the helm of Stanford's new Natural Gas Initiative three years ago, he said, because of gas's environmental benefits. "We did it because there were so many important and obvious environmental benefits to the utilization of natural gas," Zoback said. "So it’s somewhat ironic to be asked to argue for the notion that these benefits outweigh the environmental costs, when it’s the environmental benefits that got me into this business in the first place." Zoback's remarks opened the annual debate at Stanford's Silicon Valley Energy Summit, and were swiftly challenged by representatives of the Sierra Club and the Natural Resources Defense Council. Click here to read more of that article. View the whole debate below. To learn more about the Department’s programs and research within the Office of Fossil Energy, visit their website HERE. Information on additional funding opportunities can be found HERE. Youngstown seems like the heart of the rust belt, a former steel town with a strong union presence that saw massive job losses after changing economic conditions forced the closure of manufacturing plants in the 1970s. Industry is returning to Youngstown, however–it just looks a little different. Instead of the steel pipes and raw materials the area produced before, manufacturers are instead looking at the area as a perfect location for chemical manufacturing. This, in turn, is boosting hiring in the area. Having said that, North America’s education on how to make oilfields more productive appears to be stalling. After a breathtaking uphill sprint, productivity data from the U.S. Energy Information Agency (EIA) shows that the last few thousand oil wells in top-class American plays may have hit a limit—at least for now. The Company has recently turned its seven well Moser pad to sales, located in the Company’s Utica Shale dry gas window acreage in eastern Monroe County, Ohio. The Moser pad wells are currently producing approximately 100 MMcf per day collectively as the Company continues to implement its “engineered” flowback procedure designed to bring the wells up to target production rates while preserving fracture conductivity and minimizing formation damage. These wells were completed using a number of new completions techniques, which may form the basis of future completion designs beyond the Company’s “Generation-3” design that resulted in the Company increasing all of its Utica Shale type well expectations over the course of the year. The Company also announced today that it has successfully drilled its third and newest “Super-Lateral” well, the Outlaw C 11H, with a total measured depth of approximately 27,750 feet and a lateral extension of approximately 19,500 feet in 17 days from spud to TD in the Company’s Utica Shale Condensate area, setting a new lateral length record for the Company. Commenting on the operational activity, Benjamin W. Hulburt, Eclipse Resources Chairman, President and CEO, said the following, “I remain extremely pleased with our team’s operational cadence, and look forward to assessing the results from the seven well Moser pad. This pad, which contains 7 gross (7.0 net) wells with an average lateral length of approximately 7,200 feet, has recently been turned to sales slightly ahead of schedule, with starting pressures ranging up to approximately 7,500 pounds (psi). Building upon our Gen-3 frack design, this pad includes wells which are designed to test higher proppant volumes, engineered stage lengths and the use of diversion chemicals. Although extremely early in the life of these new exciting wells, we are initially very intrigued with what we are seeing. Based on the results of these wells so far, the continued performance of our Gen-3 wells, and the team’s ability to shorten our cycle times, I expect our production in the third quarter 2017 to be at least 350 MMcfe per day. EQT to Acquire Rice Energy, Become Largest Gas Producer in U.S. The largest natural gas basin in the U.S. will be home to the largest natural gas producer when two of southwestern Pennsylvania’s biggest oil and gas drillers become one in a $6.7 billion acquisition. EQT Corp., a Downtown-based firm, is buying Canonsburg-based Rice Energy Inc. in a deal that will put EQT ahead of ExxonMobil in gas production. It will also draw EQT’s focus even more to Washington and Greene counties, where much of Rice’s acreage zigzags EQT’s. The deal includes all of Rice’s exploration and production assets, as well as its interest in midstream master limited partnerships, which operate natural gas gathering and compression assets and water pipelines. It’s not clear yet what will happen to Rice’s 500 full-time employees, although layoffs are expected. After blitzing through Ohio's wetlands, Energy Transfer Equity (ETE) is once again facing a problem of its own making: pipeline construction delays. Until recently, the company's subsidiary Energy Transfer Partners (ETP) has defied long odds and analyst expectations in its rush to complete its new giant, Rover, a $4 billion, 713-mile natural gas pipeline designed to deliver natural gas from the Marcellus Shale to markets in the northeast. But the storyline shifted in April after the company spilled 2 million gallons of drilling fluid near the Tuscarawas River. Following the spill, the Federal Energy Regulatory Commission halted new horizontal drilling on the project. FERC then opened an investigation into the spill in June after diesel was detected in samples collected from the spill site. The halt in horizontal drilling, a type of drilling that is necessary for the project to be completed, turns into a near-impossibility the longshot bid to complete the project on time and raises questions about whether Energy Transfer's checkered environmental record should be of concern to the company's shareholders. The Environmental Protection Agency (EPA) has proposed pausing an Obama administration oil and gas pollution rule for two years while it reconsiders the regulation. EPA officials on Tuesday formally proposed a two-year pause on implementation of the rule, which would limit methane leaks at drilling sites and set standards for equipment and employee certification within the oil and gas drilling sector. Obama officials finalized the rule last May as part of a federal effort to cut pollution of methane, a greenhouse gas with 25 times the warming potential of carbon dioxide. Drillers contend the rule would be costly and duplicative and have urged Trump administration regulators to reconsider the measure. The EPA, under Administrator Scott Pruitt — who sued against the rule while Oklahoma attorney general — said in April that it would formally review the rule, a lengthy process that could take years to complete. Such a measure is subject to lawsuits as well. Are Conditions Ripe for Oil and Gas Mergers? A proposed bailout for Ohio’s two nuclear power plants that would lead to rate increases for FirstEnergy customers appears to be stalled in the Legislature. FirstEnergy’s average residential customer would pay about $5 more per month, while businesses and factories would see much larger increases if the Legislature approves the bailout. The Akron-based utility says subsidies are needed to save the Davis-Besse and Perry plants, which sit along Lake Erie and produce 14 percent of the state’s electricity. The company has said the plants might be sold even if subsidies are approved. A city leader and county leader have accused Duke Energy of using intimidation tactics to push through a natural gas pipeline. Cincinnati Councilman P.G. Sittenfeld and Hamilton County Commissioner Todd Portune called Duke a good corporate citizen but said Monday the company's recent behavior was "alarming." According to Portune, some people reported Duke workers came to their property and asked them to sign away their rights. A high-pressure pipeline, proposed to run through eastern Hamilton County, is at the center of the controversy. Duke has maintained the new pipeline is essential, and that it would be operated safely. It will replace one that has been in use since the 1950s and is reaching the end of its usable life, according to the company. The utility giant already operates more than 14,000 miles of natural gas pipelines, including 250 miles of high-pressure pipelines, in Ohio and Kentucky, spokeswoman Sally Thelen said. But a group calling themselves NOPE, or Neighbors Opposing Pipeline Extension, has pushed back. Duke revised its plans, reducing the pipeline's size and offering a new set of proposed routes. Still, opponents aren't swayed. The stalled NEXUS Gas Transmission project still could be completed before year’s end, but federal regulators would have to approve the pipeline soon to meet that target. “We’ve got that race car sitting there revved and all ready to go, we just need that go ahead,” NEXUS President James Grech said Wednesday during the Utica Capital Midstream Seminar at Walsh University. NEXUS was one of several pipeline projects discussed at the conference hosted by the Canton Regional Chamber of Commerce and ShaleDirectories.com. NEXUS is a proposed 36-inch-diameter interstate natural gas pipeline. The $2.1 billion project would cross eastern and northern Stark County and the city of Green in Summit County and carry natural gas from the Utica and Marcellus shales to users in Ohio, Michigan, Canada and other Midwestern markets. Detroit-based DTE Energy and Spectra Energy, which merged this year with Calgary-based Enbridge, are partners in the project. The Energy Department’s Office of Fossil Energy, whose research helped push the U.S. closer to self-sufficiency, is slated for a 58 percent cut for next year, to $280 million. The shale innovations the office develops are available to any company that can use them, including industry giants that keep results of their own studies, but they’re most beneficial to independent drillers that might otherwise find it tough to compete with behemoths such as Exxon Mobil Corp. and its $1.06 billion annual research-and-development budget. “What the federal government, at times, has done very well is they help get experiments run that many companies may not be able to afford on their own, or wouldn’t have the moxie to pull off,” said Greg Leveille, chief technology officer for ConocoPhillips, one of the country’s biggest producers. Many in Congress, even Republicans who favor cutting programs, have balked at the cuts. Senate appropriators defended the Energy Department’s research program, citing the agency’s work on shale gas development. Opponents of oil and gas activity within the city are adopting new tactics to prohibit the industry, including a new version of the so-called Youngstown Community Bill of Rights, that would deal a blow to one of the city’s key economic development tools. The Ohio Department of Natural Resources has now released the production data from the Utica shale for the first quarter of 2017. 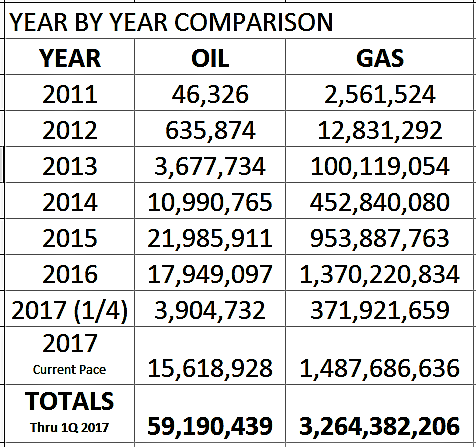 As always, we are going to give you a look at how the numbers compare to past quarters, past years, and how they break down among the various drillers who are active in Ohio and the counties where they are drilling. 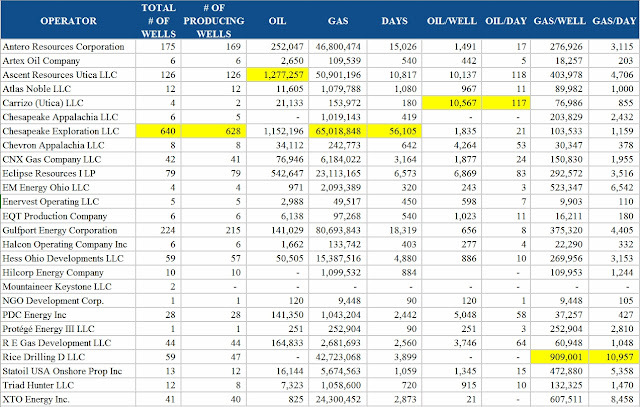 We also have the top 10 oil and gas wells detailed below. So, after four consecutive quarters of declining oil production (and six consecutive quarters of oil production rates falling), the first quarter of 2017 saw a quarter-to-quarter rise in total oil production and in oil per day in production as well as oil per well. Gas production was back on the rise as well after there was a decrease in total production and a decline in production rates in the fourth quarter of 2016. In fact, the first quarter of 2017 saw a new high in shale gas production from the Utica. 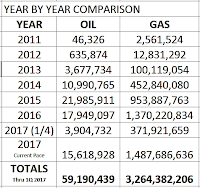 After year-to-year oil production saw a decline in 2016 from 2015, the first quarter results suggest that production could be on the decline for the year of 2017 as well. If oil production continues at its current pace, over 2,000,000 less barrels would be produced from the Utica shale in Ohio in 2017. The gas production numbers are different. 2016 continued the trend of total production increasing year-over-year, and based on the first quarter results 2017 could very well be the same. 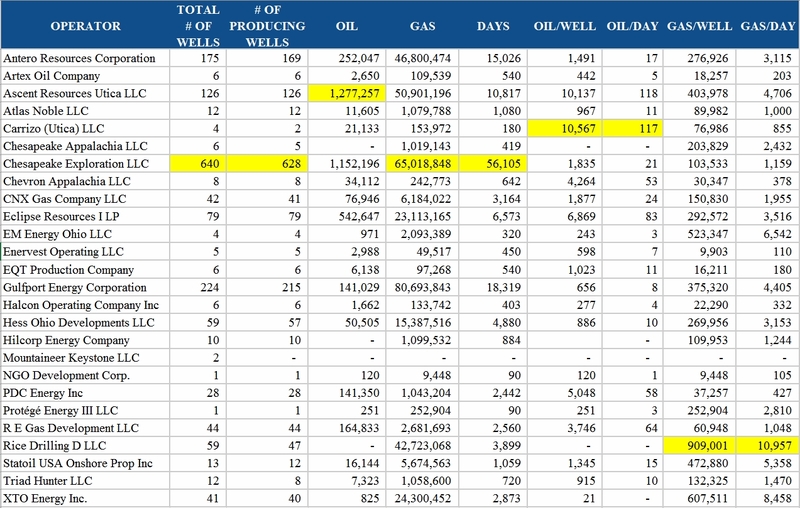 If gas production continues at its current pace, there would be an increase of over 117,000,000 MCF this year. That would be the smallest increase in four years. After Carroll County had 2 of the top 10 oil wells in Q4 of 2016, it falls off the list this quarter. Instead, there are 5 wells in Harrison County among the top 10. 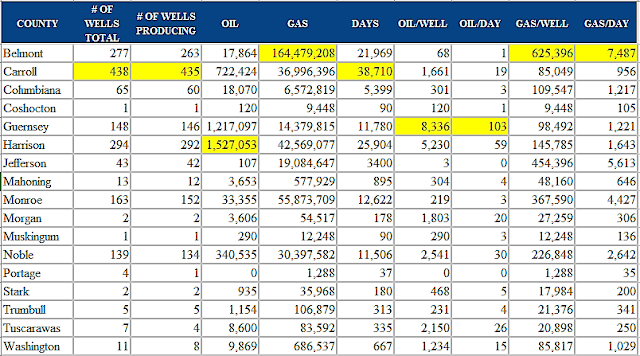 Guernsey has the other 5, after having 5 of the top 10 wells in the previous quarter. The Purple Hayes 1H well was the top oil-producing well for the second straight quarter, although the total barrels produced and the oil per day both dropped. There was quite a bit of change here from what was seen in Q4 of 2016. Jefferson County had none of the top 10 gas wells in the Q3 of 2016, then had 4 of the top 10 in Q4. Now it again had none of the top 10 gas wells in Q1 of 2017. Instead, Monroe County - which had none of the top 10 wells in the previous quarter - had the top 5 gas producing wells in this quarter. Yellow highlights mark the county the highest totals for any county during the quarter. Yellow highlights mark the county the highest totals for any operator during the quarter. Click here to download the full report from the ODNR with all of the data. Despite the backing of fringe national environmental groups who brought Dakota Access Pipeline organizers to Ohio to protest fracking in the Wayne National Forest, a recent #NODAPL copycat “long-term resistance camp“ in Monroe County has proven to be nothing more than a decidedly short-term political stunt. The beautiful campsite where the so called “long-term resistance camp” was set to be held this week is absent of one single protestor and is evidence that there is in fact no “long-term resistance camp” whatsoever. This example proves beyond a shadow of a doubt that the recent public relations stunt was in fact hosted, organized and attended by people who do not actually live and work in the area. It also shows the entire fiasco was concocted for the sole purpose of generating misleading headlines to promote a movement that has no real local following. Out of Town And Out of TouchLast month, EID took a look at the various #NoDAPL-style pipeline protest camps cropping up throughout the country. At the time, no such camps had been set up in Ohio. But just one month later, this latest craze of the “Keep It in the Ground” (KIITG) movement made its way to the Buckeye State. A so-called #NoDAPL copycat “action camp” aimed at stopping fracking and proposed pipeline routes was set up in the Wayne National Forest. And it was organized by none other than Myron Dewey, an independent filmmaker and one of the more prominent online voices of the Dakota Access Pipeline (DAPL) protests, along with Athens-based Appalachia Resist!, Ohio’s most fringe environmental activist groups. While out-of-town weekend copycat campers like to talk a big game regarding their “long-term resistance” plans in Ohio, the reality is anything but. 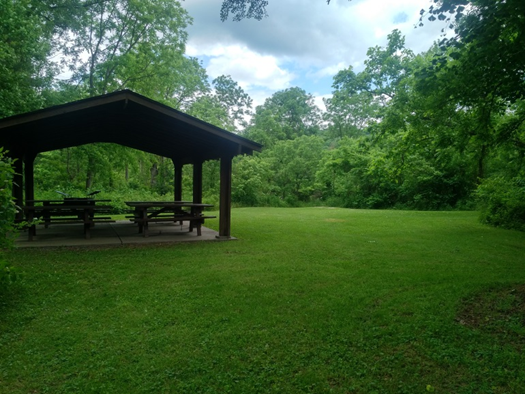 In a recent press release, activists announced “long term resistance camp launched,” followed by a May 31 Facebook post calling on campers to come join their so-called resistance camp at Lamping Homestead Campground in the Wayne National Forest. During the first quarter of 2017, Ohio’s horizontal shale wells produced 3,904,732 barrels of oil and 371,921,659 Mcf (371 billion cubic feet) of natural gas, according the figures released today by the Ohio Department of Natural Resources (ODNR). Natural gas production from the first quarter of 2017 showed an increase over the first quarter of 2016, while oil production was reduced for that same period. The average amount of oil produced was 2,503 barrels. The average amount of natural gas produced was 238,411 Mcf. The average number of first quarter days in production was 86. We will have our breakdown of the production data published as soon as it's ready!